I ordered this cookbook on Amazon and it arrived yesterday. Its called Falling Cloudberries by Tessa Kiros. I ordered it b/c it was featured, to my surprise, in House Beautiful magazine. 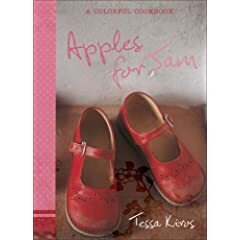 I had been wanting to order it based on how much I enjoyed Tessa Kiros' other cookbook that I own: Apples for Jam. The recipes are simple, simple ingredients, and the great results remind me of how my mom and grandma used to cook - only with a more European flair. I guess you could say its comfort food but with a great mix of origins from many countries. There were so many great reviews of Falling cloudberries, but at first pass, I'm not sure I'm sold on it. The ingredients are more unique and harder to find. But I will try a few recipes to see if I'm just not giving it a fair chance. There are a ton of recipes in there and the pictures are gorgeous. Its sort of like looking at her family tree and its as if she is sharing all her best family recipes in a very honest and humble way. One thing I know about myself is that its what I call the "cozy" factor - the comfort food factor - that has gotten me to the weight I'm at. I love all things cozy. It wasn't until the last few years that I really realized it. When I thought about all the things I love the most - the common denominator was COZY. For example, I love a rainy day b/c I can light a candle, curl up on the couch with a cozy blanket, sip coffee and watch a movie. I love to knit - a cozy habit knitting cozy garments like scarves, sweaters, baby booties and soft warm blankets (cozy, cozy, cozy and more cozy). I love collecting coffee mugs - and drinking coffee - (again cozy). I love fire in the fireplace on a cold evening and a fire on the deck in the middle of summer roasting marshmallows. Most of all I love cozy food. My favorites are making soup (comfort food) potatoes (prepared any way), macaroni and cheese (rustic, gourmet kind), and anything in a crock pot. See what I mean? Everything is soft, warm, cozy that I love the most. So how do I satisfy that need for cozy when a cozy lifestyle (sitting for hours knitting isn't great exercise) and eating cozy food ('nuf said) lends itself to a soft and cozy body? You get a lap band! 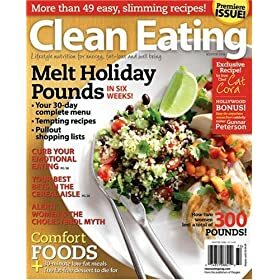 So, when I ordered the new cookbook, in order to get free shipping, I also ordered a subscription to "Clean Eating" magazine. I eat 'clean' for the most part - meaning I eat a little processed food as possible and try to eat fresh food. Sometimes, that's just downright impossible - but I lean, at least, in that general direction. If you like simple recipes with basic ingredients made mostly of fresh veg/fruit/etc. you'll like this magazine. I'm going to also give it a go and I'll let you know if every issue is as good as the one I bought in the bookstore the other day.